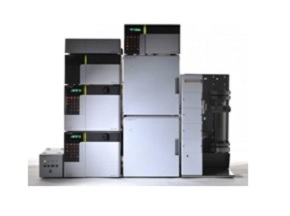 Shimadzu has installed more than 2000 preparative HPLC systems throughout the world, and remains committed to improving the purity and speed of separation and making this technique more cost effective. Using our broad experience and technologies at various scales and in diverse fields, we have significantly enhanced the performance that can be obtained from preparative HPLC. The new LC-20AP preparative pump has improved pressure performance under high flow rates (42 MPa for up to 100 mL/min, 30 MPa for upto 150 mL/min), enabling the use of a higher separation column, so fractionation with high purity can be achieved even for minute quantities of target compounds, such as impurities in pharmaceuticals. This fractionation system uses the LC-20AP solvent delivery unit with a 20-50 mm internal diameter column; it is suitable for automatic continuous fractionation. With an analysis column size (1 mL/min), studies of separation conditions or load quantities, or verification of the purity of the fractionated liquid, can be performed. The system can be configured from a variety of optional accessories, such as 5 sample injectors, 3 recycle valves, 2 fraction collectors, etc. This system uses the 6AD solvent delivery unit (maximum flow rate 20 mL/min). A kit that minimizes the internal volume is mounted to enable high-efficiency recycle separation (closed-loop recycle separation).